AUTO WORKERS WERE supposedly whipped, tamed and back in their cages. But “No”! The beast has raised its head again. Read a statement by the Solidarity Political Committee on the case for immediate withdrawal from Afghanistan, issued on the day the occupation entered its ninth year. For more info about our work in the anti-war movement, email info@solidarity-us.org. The concessions just voted down were to last until 2015, i.e. through the new contract still to be negotiated for 2011. They included severe limitations on the right to strike, a six-year freeze on new-hire pay that had already been cut in half, and the reduction of skilled trades classifications. The argument of the company and the union leadership was that these measures were needed to “match” the labor cost savings at the bankrupt Chrysler and General Motors corporations. At half pay, young auto workers will not be able to buy the cars they build. With the average nonunion industrial pay in the United States substantially higher than the $14.50 that Ford new-hires currently get, what does Ford—let alone the UAW—think it’s doing? Anyone who has been subject to the discipline needed in a modern auto assembly plant knows that—short of fascism—you can’t effectively run one here for this kind of pay. The top goal of this savage pay cut is not so much immediate savings as the extermination of the UAW as a respected force on the shop floor as well as politically. Ford will raise pay later, but hopes to dictate its own terms. The most prominent sentiment on the shop floor and around local halls was that we must vote “no” in order to hold on to the right to strike over wage raises in next year’s contract negotiations. 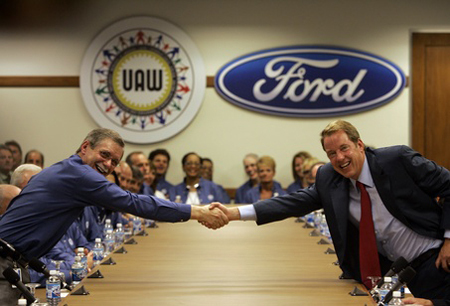 Ford and the UAW bureaucracy countered that the union has not struck Ford since 1976. Members replied, “If it’s not that important, then why do they want to take it away from us?” There was no good answer to that. Anger was very palpable during voting at union halls around the country. At UAW 600, local staff backed off as a line of Truck Plant voters hissed at them that they would take only Vote No leaflets. 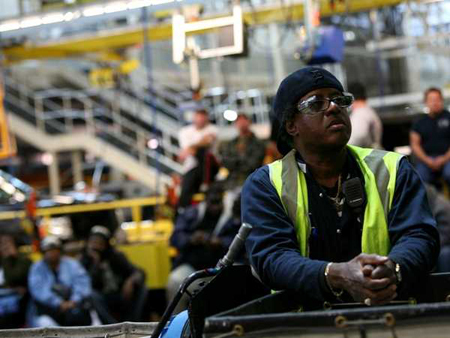 During the Vote No campaign, the national union leadership lost political control of the most important Ford plant in the US if not the world, the Dearborn Truck Plant, one of the plants in UAW Local 600. Full-time Truck Plant bargaining committeeperson Gary Walkowicz, who has long been a national leader against concessions at Ford, plant president Nick Kottalis, and five other Dearborn Truck Plant union officers came out with a signed statement against these concessions during the campaign. The Truck Plant makes the F-150 pickup truck and a huge proportion of Ford profits. Members there voted No by 93%. Skilled trades worker Judy Wraight was one of the authors of the Local 600-wide “vote no” leaflet quoted below. Across all Local 600 Ford plants, the vote was No 3087, Yes 823. The new faultline in the Ford empire should be an inspiration to workers everywhere. A Ford executive responding to the vote in Kansas City — earlier and virtually equal to that in the Truck Plant — said he was “shocked.” And perhaps Ford workers have somewhat alarmed the U.S. ruling class as a whole. The national contract rejection sprang from factors ranging from a sense that Ford had come back for concessions a time too many, to rebellion by lower-level union officers in touch with the rank and file, to a presence of radicals, including socialists, in some key plants. It is the first time a national auto contract was ever voted down by a majority of the membership! Such talks are always said to be underway, but Ford was making a point by making this statement at this time: We’re back at concessions bargaining the day after. “The strike threat defends our money, benefits, rights—and UAW political clout…Power in Washington starts with our power right here (for true national health insurance, converting closed plants to greener jobs and alternative transportation for auto and other workers, and defending the gains of civil rights movements, etc.). It remains to be seen whether unity against company attacks and rejection of timid union leadership can be converted into a sustained rank-and-file organization for action including strike mobilization, union democracy, and international solidarity. This could feed social movement unionism, helping to unite the working class and reverse the decades-long decline of the union movement in the United States. For activists at Ford, the way forward is upward but not yet entirely clear in its details. The vote was notably dependent on a “No” or neutral position taken by shop-floor officers who had supported all the concessions up to now. Some of these officers concluded during the campaign that they could not be re-elected if they supported the latest concessions at a company returning to profitability. What will those who followed the rank and file yesterday do tomorrow? Such questions will be prominent until union officers have to side more consistently with a rebellious rank and file. The 2010 UAW Convention delegate and other local elections, as well as the 2011 contract, are good opportunities. The UAW Convention next year is in Detroit. Despite efforts at international solidarity against union concessions at Ford, the Canadian version of these concessions has been adopted by vote of the Canadian Auto Workers union by 83%. Today international union solidarity is required for any comprehensive fight for jobs, pay and working conditions. —Ron Lare is a retired member of UAW Local 600 and former executive board member.